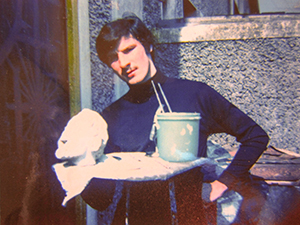 Gerry Glynn was born in Dublin and formed an early interest in drawing, painting and sculpture. Apart from a short period in the National College of Art and Design, Dublin he is self- taught. He developed his own distinctive style in oil painting but was first influenced by classic sculpture, the surrealists and eventually by the Impressionists. He is at home with most of the painterly subjects, being an exponent of street scenes, still life, landscape and seascape. He has always expressed a flair for a magic realist style which is uniquely his own. During the 80’s Gerry was recognized by winning seven top awards in National and International Art Competitions for drawing and painting including his magic real piece ‘The Ninth Hour’. He also achieved awards in National Portrait Competitions. He worked in the field of animation - background design, layout and rendering. His works have been acquired by the the Dept of Defence, NTMA, Castle Leslie, Co Monaghan and are also in collections in Ireland, Europe, United States, Australia and Japan. The work has been sold through auctions and to a number of television and sport personalities. He has a listing with Whyte’s Buyer’s Guide to Irish Art and exhibited as a finalist in the Uniquely Dublin exhibition held in the Little Museum of Dublin in 2013.